Chicken, blue potatoes, and leeks under a blanket of Irish cheddar cheese. Irish pizza? Cockaleekie pizza? 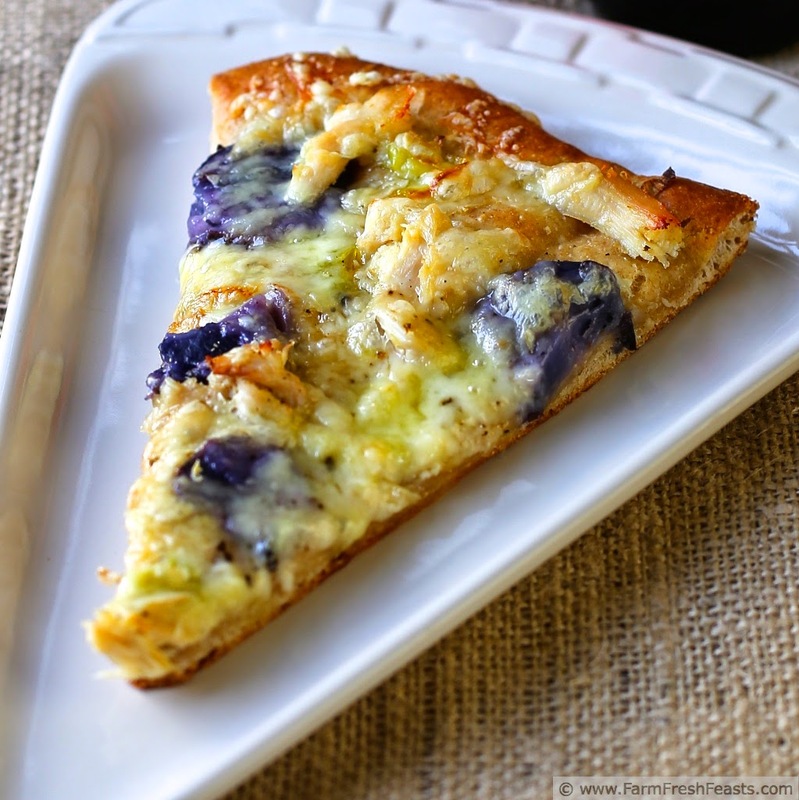 Colorful pizza with chicken, leeks and potatoes? You choose the name that works. A community supported agriculture (CSA) farm share is not typically a source of exotic produce. Although turnips, kohlrabi and celeriac were novel and exotic to me--and Swiss chard may be new to some--these crops have been around. When we got purple potatoes in the share last year it was a surprise and a delight. I've played with blue potatoes from Costco before, and it's also fun to make colorful food straight out of the farm share box. For this pizza I wanted to punch up the color of a chicken, leek, and potato pizza. Yes, that's practically cockaleekie pizza, but according to Google Trends no one searches for that. So you get a boring-yet-descriptive name. I've got a Corned Beef & Cabbage Pizza coming up, but to help mentally shift gears from Valentine's day/Mardi Gras/Chinese New Year to St. Patrick's Day I'd like to share this pizza now. Why am I sharing St Patrick's Day recipes when I'm Scandinavian/Scottish, not Irish? Advertising, folks . . . it works on me. Cabbage goes on sale shortly after I've finished up the farm share veggies and had my fling with mushrooms from the store. We like corned beef and potatoes and eat them despite not being kissable due to our heritage. Shoot, we eat a bunch more seafood because it's also on sale. Speaking of ads, I'm playing around with Amazon ads in my sidebars. Please let me know if they are intrusive, thanks. 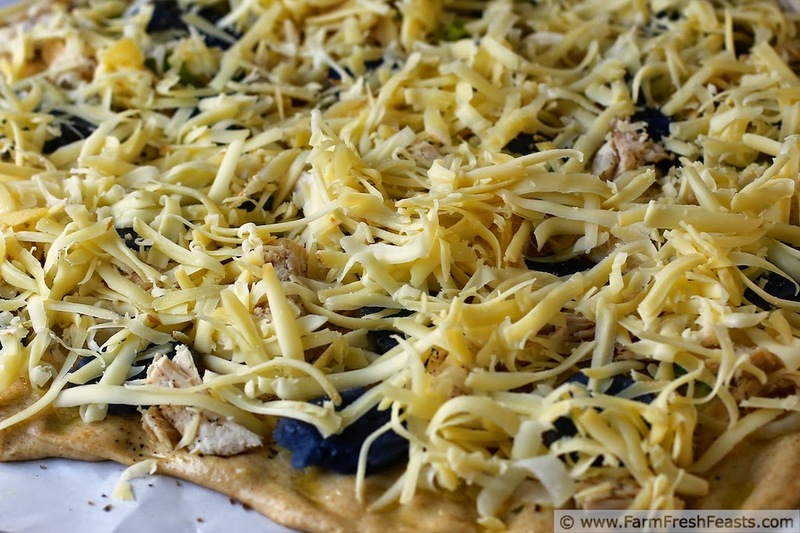 For another Irish-themed pizza, please check out my Tremendously Green Pizza (talk about a non-SEO friendly title!) that has bacon, cabbage, and potatoes. You can find other pizzas for your Friday Night Pizza Night at my Visual Pizza Recipe Index. Preheat oven to 450 degrees Fahrenheit. I recommend using a pizza stone, because it really makes a difference in my crust which makes me successful in my endeavor and therefore happy and wanting to replicate the homemade pizza thing another week. All from a simple stone. And parchment paper. Can't forget that key element. Where was I? If you've got a stone, preheat it. On an oiled piece of parchment paper, stretch out pizza into a pleasing shape. Brush crust with a bit more olive oil, then scatter leeks across evenly. Slice potatoes and add to the pizza, then top with chicken. Scatter salt and pepper across the chicken & potatoes, then top with copious amounts of cheese. It's really good on this pizza--don't skimp. 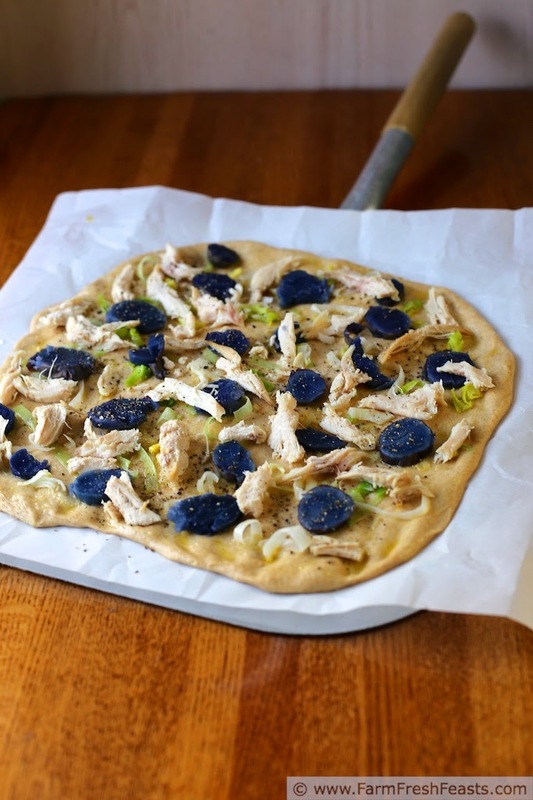 Slide the whole thing, parchment paper and all, onto the preheated pizza stone. After 5 to 8 minutes, shimmy the pizza off the paper and bake directly on the stone until the cheese is bubbly. This takes another 3 to 5 minutes for me. Transfer to a rack to cool slightly, then slice and serve. Don't skimp on the cheese. You'll thank me. 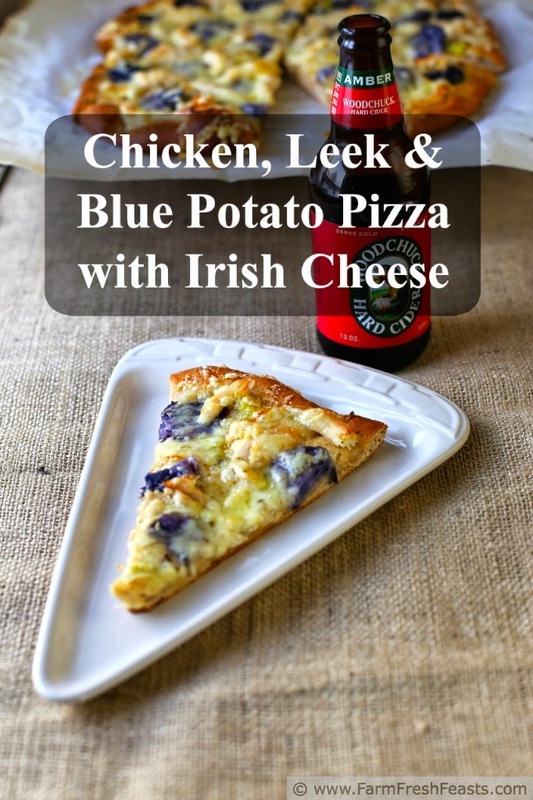 Totally in love with pizza and adding an Irish twist to this looks like perfection! My family insists on pizza Friday (to the point of driving me batty when I want to have, say, waffles for dinner). I need to keep it fresh, and they are game to try new things, so this works for us. This looks so great! I need to get some leeks so I can make it happen! Yes you do! I'm about ready to ransack the freezer to see if I've missed any bags of leeks. What a stunning pizza! I love that you used blue potatoes and leeks, what a fantastic flavor combination. The classic combos are that way for a reason. I'm sure they got started just because that's what the cook had on hand, but if it works . . . go with it. Well I probably won't get the blue potatoes by my husband but the rest of it should go down "real easy" - marrying the Irish person and getting the Italian food lover has been my fate - in a lovely way - and I'm thinking this might be our St. Patty's Day dinner! I think that's a terrific St Pat's day dinner--even if it's not on a Friday night! That fate sounds pretty good to me, all except for the not eating blue potatoes part. They're not beets, you know. It's *still* a great idea! I love love love the blue potatoes! I've played around with them a few times too. They add such a beautiful color to anything you add them too. This pizza looks great! What I'm particularly please with is how the blue potatoes keep to themselves. I mean, beets throw their weight around, color-wise, causing everything to turn shockingly pink. This pizza would be good without the chicken, I think. That cheese is just so delicious. I really don't want to lead you astray. I'm happy to lead you astray into canning tomatoes, but not into eating chicken. 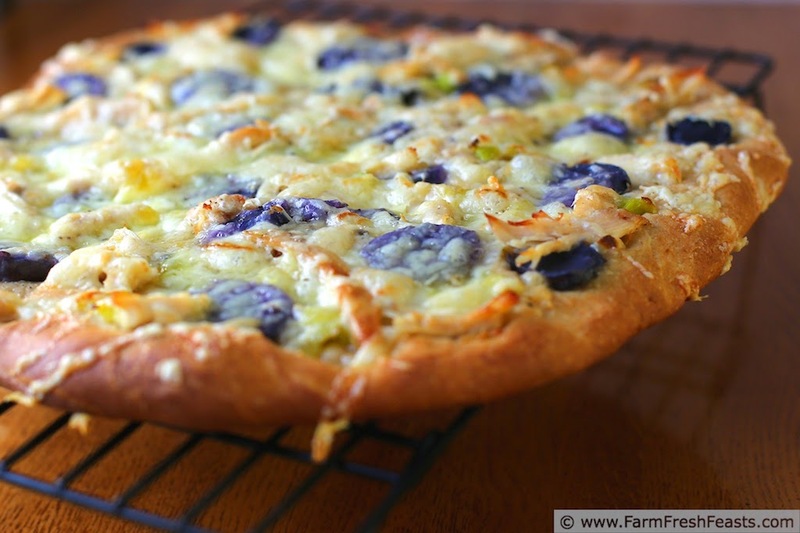 Fantastic flavor and texture combo on this pizza! Thanks for linking up with What's Cookin' Wednesday! This pizza really turned out nicely.